This was my own way of solving a problem every writer faces: excessive closeness. When you’ve inhabited every sentence of a text, when you know why each word is there, it’s impossible to come to it fresh, as a reader would. You’re the parent of a deeply flawed child whose failures are invisible because they’re part of the grain of your life. You need to fool yourself into seeing your offspring with a stranger’s eyes. Time is perhaps the most effective distancing device. If you can leave your draft in a virtual drawer for at least six months, it’s amazing how clear its flaws become, how self-evident the solutions. But if I’d left Sockpuppet untouched for six months between each draft, I’d still be writing it, instead of preparing it for publication in the spring. So I looked around for other ways to extract myself from the potentially never-ending flow of the drafting process, and allow my gaze to fall on the book as though for the first time. 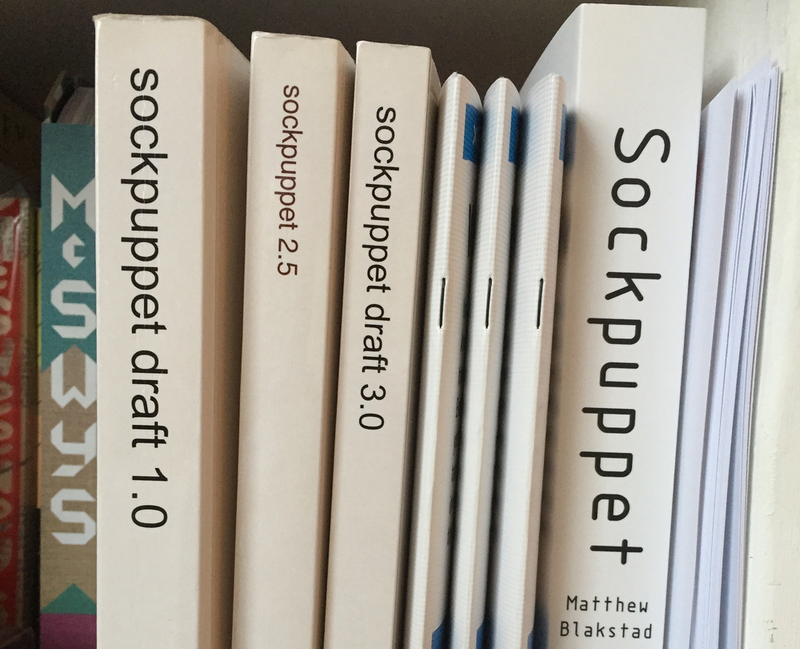 The evolution of a sockpuppet: my three draft copies sit on my shelf alongside samplers and an advance review copy produced by Hodder. Don’t ask me what happened to draft 2.0. Long story. Professional proofreaders recommend printing a text before reviewing it, so that errors don’t slide past unseen through the slippery medium of screen-text. This greater attention to specifics is also an excellent reason to commit your own writing to paper; but there’s more to it than this. Something fundamental changes when you bind the malleable text from your word processed file onto a printed page. It becomes rigid and somehow more present, like a fly preserved in amber. Which is why, even though I welcome the digital revolution in fiction publishing, I think it’s way too early to herald the death of the printed book. And I don’t believe that opinion makes me any kind of luddite. Take music. There’s no doubt that digital distribution has transformed that industry. Over the past couple of decades it’s been subjected to a textbook example of the tech evangelist’s favourite concept, disruption. Which is interesting, because in many ways music itself has remained unchanged as it’s slipped from format to format. Clearly, I don’t mean that the way we consume music has stayed the same. There have been profound revolutions in its distribution and economics; but leaving those aside, the things that have changed in the way we actually listen to music are more to do with the context in which we receive it, than to the music itself. To use two other tech industry terms, it’s curation and discovery that have been so profoundly altered. A vinyl album had a different dynamic (two opening tracks, each packing a bit of punch, a few duff songs buried within its two 15 minute arcs) from a CD (one opener, a single 70 minute arc) or from a download (single tracks and no proper support for long-form classical music, grr). As these formats overtook one another, we've seen fundamental changes in our experience of consuming music – and in the kind of content we consume through iTunes, Spotify et al. Still, if you sit down today to stream a thirty-year old song, you’ll hear exactly the same thing as if you were playing it the day it was released – provided your vinyl was dust- and scratch-free. Unless you’re an audiophile, format doesn’t alter the experience of hearing music. It certainly doesn’t make the slightest difference to my ageing ears or my mid-range headphones. This preservation of the listening experience has made it easy for music to slide off the surfaces of physical media and dissolve into billions of transient streaming bits. It’s allowed this to happen in the blink of an eye, without once disrupting our experience of listening to it. These days only bearded hobbyists buy vinyl – in premium-priced limited editions. Many look at the disruption of the music industry and predict the same fate for the novel. Printed books, they tell us, will soon be the preserve of fetishising collectors, who’ll lovingly sniff the artisanally-printed pages of numbered-edition hardbacks while the remainder of the human race switches comprehensively to digital without drawing breath. Maybe this will happen, maybe not. There’s no doubt that the take-up of ebooks has been rapid; though this year the growth spurt began to stutter. In the US, e-book sales were down, while paperbacks were up (see the table below) while in the UK, Neilson Bookscan reported that 2015 is the first year since 2007 that paper format sales rose. Waterstones has even announced that it’s no longer going to sell e-readers because sales of those devices are declining in relation to print. So the death of print is not inevitable. My own sense is that a big segment of the print market is resilient to digital transformation – because some books simply work better in print. Because digitising a novel is a more profound transformation than digitising a song, and an ebook is different from a paper book in a way that an MP3 is not different to a vinyl track. And while that difference presents huge opportunities for digital fiction, I also believe it will also protect the printed word from extinction. To be clear: when I talk about ebooks in this context, I don’t mean interactive fiction or other forms of branching, game-based or mixed-media narrative that are opened up by digital. I’m extremely interested in the potential of these forms and I’ll be writing about them soon. Nor am I referring to the raft of innovations that are aiming to bring us fiction tailored to the screens we carry with us. New platforms like Oolipo are exciting because they’re rethinking what fiction needs to be when it’s consumed on a smartphone or a tablet. All of these new developments are aspects of what publishing will become, and I embrace them. But they’re not what I’m focussed on here. You can believe that digital has incredible potential without having to believe that paper is dead. If we want to claim that print is history, we need to believe that the linear novel or story, in their current form, will no longer be read on paper. And to believe that we need to believe that, as with music, this strange substance called fiction remains unaltered when we port it across from its ancient baronial residence on the printed page, to its new home in that space-age bachelor pad we call the e-reader. But I don’t believe that. An ebook is already different from a print novel, before you add any interactivity or other digital folderol. This difference lies in the experience of reading the ebook, as compared to the book-book. If I was wearing my communications professional hat (presumably a woollen beanie?) I’d call this quality the user experience. But on this site, I’m wearing my novelist hat (a velvet smoking cap?) so let’s call it the phenomenology of reading. Put simply, it’s the difference between on the one hand, swiping left and on the other, licking your finger in anticipation of turning a page. Moving to a new platform tends to shed many of the social and behavioural norms invested in the previous platform; and so it is with the shift from hardback to e-reader. Some of these changes may seem less relevant to the experience of reading – collectibility for instance, or the ability for an author to graffito the frontispiece of their own work. These are symptoms of how the book-as-thing is fetishised in our culture: of the reverence that has given the novel a culturally privileged platform from which to speak to us. We fetishise the e-reader and the tablet, too, of course – but we fetishise their capabilities as universal machines – their ability to do anything, serve up whatever we demand in a few seconds. 100,000 books instead of just one. In which case, we’re fetishising the two formats' intrinsic strengths. Paper is specific, the screen is general. Paper is for dwelling on, for providing a physical relationship with the word; the screen is for hopping around, constantly pressing forward. InThe Social Life of Information, information theorist Paul Duguid tells how, in a university library, he came across a medical historian who was sniffing a bundle of old letters. The historian was searching for the smell of vinegar, which was used by 18th century physicians to treat cholera. The surface narrative in those historic documents might have told him one story, but, to his informed nostrils, that scent betrayed a richer context that conveyed another, sadder narrative. In a less dramatic way, the physicality of ink on paper adds a dimension that’s lacking on screen. Against which, the dynamism and fluidity of an ebook are unique to that format. One, reading the beautifully choked and convoluted prose of Will Self's Umbrella on a Kindle. Didn’t work. The words were ungrounded, slippery. I had to switch to paper to digest them properly. Two, reading Neal Stephenson’s typically gargantuan space epic Seveneves in hardback. Aside from the fact that my wrists have stopped speaking to me, the thumping pulse of that book would have leant itself far better to ebook. And in case you think I’m saying, literary is for print, genre is for ebook, that isn’t it at all – not least because, as I’ve written about before, I think that’s a bullshitty dichotomy. No, it’s that chewy prose that you need a machete to cut through, where you need to pause to dwell and take your bearings, that works best on paper; while breezy prose that urges you to race through its well-signed passageways to reach its urgent conclusion works best on screen. I’m now so used to solving crosswords on screen, that when once in a while I do one in the paper, I find myself swiping the inert grid with my finger to select a clue. A few months back I saw a young boy standing in front of a back-lit iPad poster in a tube station. In the photo, the keyboard was up on the iPad’s screen. The boy was vainly pressing the keys on this photographic image of a metaphorical keyboard, bewildered as to why the virtual machine wasn’t responding. So things will I’m sure continue to be blurry. Still, what happens in markets is, people choose what they like, and suppliers follow demand. My strong hunch is that there’ll be a natural sifting process that will tell us what kinds of fiction people prefer to read in each format. And I'm willing to bet that print will stay favoured by many, if not most. I’m going to keep watching this one. I hope I’m right. Because I still love paper.